Many commentaries for pastor/teachers have practical insights woven into the exposition; much like listening in on a sermon. However, due to the above sections in Teaching the Text commentaries, this series is far more uniquely useful for teachers, not just by “showing how it’s done”, but also offering suggestions and advice for the teacher to consider, all in a very attractive design with full colour images. 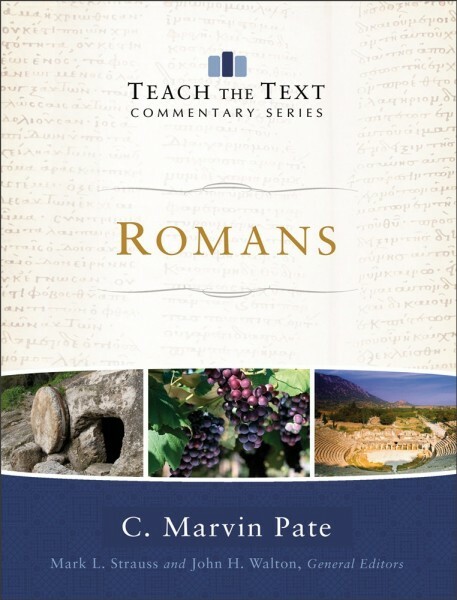 Due to the unique Teach the Text format, it shouldn’t be too hard to determine the worth of Marvin Pate’s Romans before one even considers his particular interpretative and theological views. However, one will naturally be curious as to whether Pate offers anything fresh or insightful in interpretation. 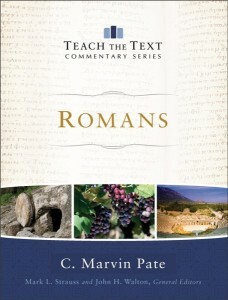 Broadly, Pate contributes two unique emphases in his take on Romans: Paul’s theological focus and the structure of Romans itself. As to the former, Pate highlights the eschatological aspects of Romans and of Paul’s theology (see Pate’s Apostle of the Last Days). As to the latter, Pate argues that Paul intentionally structured Romans to emulate the Suzerain-Vassal treaty format of Deuteronomy so as to emphasize that the new covenant has replaced the old. To see how it plays out, check out Nate Claiborne’s summary in his review, but the whole commentary should be read to see Pate’s argumentation. I’ll admit that I was skeptical before working through the commentary since Pate is positing something so specific about Paul’s intentions and potentially forces a macro-structure on the text that is not there. After teaching through Romans, I can relate to the strong new covenant emphasis that Pate sees in the text, but in places it felt forced onto the text. Pate’s structure resembles other commentaries’ anyhow, but if his suggestion is true then our interpretation of Romans is greatly assisted. Not only that, but it serves to guard against a potential imbalance in seeing Romans as purely “occasional” with regards to Paul’s mission to Spain; seeing Romans as a carefully constructed Gospel presentation is reclaimed. Rom 2:6-11 is speaking of a hypothetical situation: “acceptance before a righteous God is based on perfectly following his law, which, in fact, no one can do” (p44). Rom 2:14-16 describe Gentiles who disobey the Noahic Law, and while Rom is primarily indicting the Jews, 2:12-16 is making “a similar case against the Gentiles” (p46). Rom 3:22 is translated “faith in Christ”. Rom 5:12-21 present all mankind as breaking the Torah in Adam’s sin. “The law that Adam broke was the Torah before it was inscribed by Moses”, which was a “common assumption in Second Temple Judaism” (p124). Rom 7:1-12 describe Paul’s past experience with the Torah, which also recapitulates Israel and Adam’s. Rom 7:13-25 describe Paul’s struggle as a Christian living in the overlap of the ages: “union with Christ and with Adam both pertain to the Christian” (p154). Rom 8:28-30 teach that God’s foreknowledge “is rooted in God’s covenantal love for Israel” (p175), but later he sides against a Calvinistic reading of Romans 9. Rom 9 teaches individual election unto salvation, but since Rom 9:6-29 focuses on the sovereignty of God and 9:30-10:21 emphasizes human responsibility, then despite God’s unconditional election of individuals, “paradoxically humans [still] have the power and responsibility to choose Christ for themselves” (p195). Pate makes a few idiosyncratic statements throughout his commentary. For example, in the second quote the Noahic law is imported into the text. Whether this is legitimate or not cannot be determined from Romans itself. Much like Pate’s structure of Romans itself and Paul’s eschatological vision, it is difficult to see whether it helps clarify the text or is artificially imposed upon it. Pate often brings in insights from Jewish theology that, due to the restrictions of the Teach the Text series, he is not able to support, leaving the reader wondering if he is over-interpreting the text by external controlling concepts. I suspect being more familiar with Pate’s other works will help settle the question. The illustrations that Pate provides are on the whole very helpful, at least in providing examples for the teacher to follow, but there are a few odd exceptions. For example, Pate appears to recommend The Shack to readers, and quotes the disputed saying of St. Francis of Assisi (p55). Also, a few issues seemed oversimplified for the sake of clarity. Pate’s representation of the Calvinist/Arminian debate, particularly the Remonstrance, is a good example. The Five Articles of the Remonstrance were not a point-by-point disagreement with TULIP (p194), given that the Articles began the debate; not to mention that TULIP is a modern acronym. I also don’t think that the age-old Calvinism/Arminianism debate can be solved so easily by holding a so-called “Calminian” perspective, where two logically contradictory views are true. Of course God’s sovereignty and human responsibility are both taught in Scripture, but they cannot be reconciled by holding positions akin to “A is A but also not-A”. Lastly, the many images, maps, and tables in the commentary were fantastic, but I wish they were available for teachers to use. Since this series is designed to assist teachers, providing the images for free on the Teach the Text website would be immensely helpful as teachers are always on the lookout for resources that will help communicate a text. The Teach the Text commentary series needs to offer something unique to justify its existence, but I believe it has done so. This commentary would serve nicely in giving a broad overview of Romans, getting the thrust of the letter, and as a fine second-commentary. I used it alongside Schreiner’s in the BECNT series and it provided a nice overview and “next step” towards teaching a passage. Pastors and teachers will most benefit from this series, but despite the aims of the Teach the Text series, it would be surprisingly helpful to students of the Word as well! The short summaries of the text, images and illustrations are not only beneficial for teachers. Pate has achieved a particularly impressive feat, that is, he has created a commentary on Romans which offers something new in concisely summarizing a dense and difficult letter, offering a unique approach, and emphasizing often-overlooked aspects to Paul’s theology.